The world’s largest volcanic eruption of the 20th century broke out at Novarupta (fig. 1) in June 1912, filling with hot ash what came to be called the Valley of Ten Thousand Smokes and spreading downwind more fallout than all other historical Alaskan eruptions combined. Although almost all the magma vented at Novarupta, most of it had been stored beneath Mount Katmai 10 km away, which collapsed during the eruption. Airborne ash from the 3-day event blanketed all of southern Alaska, and its gritty fallout was reported as far away as Dawson, Ketchikan, and Puget Sound (fig. 21). Volcanic dust and sulfurous aerosol were detected within days over Wisconsin and Virginia; within 2 weeks over California, Europe, and North Africa; and in latter-day ice cores recently drilled on the Greenland ice cap. There were no aircraft in Alaska in 1912—fortunately! Corrosive acid aerosols damage aircraft, and ingestion of volcanic ash can cause abrupt jet-engine failure. Today, more than 200 flights a day transport 20,000 people and a fortune in cargo within range of dozens of restless volcanoes in the North Pacific. Air routes from the Far East to Europe and North America pass over and near Alaska, many flights refueling in Anchorage. Had this been so in 1912, every airport from Dillingham to Dawson and from Fairbanks to Seattle would have been enveloped in ash, leaving pilots no safe option but to turn back or find refuge at an Aleutian airstrip west of the ash cloud. Downwind dust and aerosol could have disrupted air traffic anywhere within a broad swath across Canada and the Midwest, perhaps even to the Atlantic coast. The great eruption of 1912 focused scientific attention on Novarupta, and subsequent research there has taught us much about the processes and hazards associated with such large explosive events (Fierstein and Hildreth, 1992). Moreover, work in the last decade has identified no fewer than 20 discrete volcanic vents within 15 km of Novarupta (Hildreth and others, 1999, 2000, 2001; Hildreth and Fierstein, 2000), only half of which had been named previously—the four stratovolcanoes Mounts Katmai, Mageik, Martin, and Griggs; the cone cluster called Trident Volcano; Snowy Mountain; and the three lava domes Novarupta, Mount Cerberus, and Falling Mountain. The most recent eruptions were from Trident Volcano (1953–74), but there have been at least eight other, probably larger, explosive events from the volcanoes of this area in the past 10,000 years. This report summarizes what has been learned about the volcanic histories and styles of eruption of all these volcanoes. Many large earthquakes occurred before and during the 1912 eruption, and the cluster of Katmai volcanoes remains seismically active. Because we expect an increase in seismicity before eruptions, seismic monitoring efforts to detect volcanic unrest and procedures for eruption notification and dissemination of information are included in this report. Most at risk from future eruptions of the Katmai volcanic cluster are (1) air-traffic corridors of the North Pacific, including those approaching Anchorage, one of the Pacific’s busiest international airports, (2) several regional airports and military air bases, (3) fisheries and navigation on the Naknek Lake system and Shelikof Strait, (4) pristine wildlife habitat, particularly that of the Alaskan brown bear, and (5) tourist facilities in and near Katmai National Park. 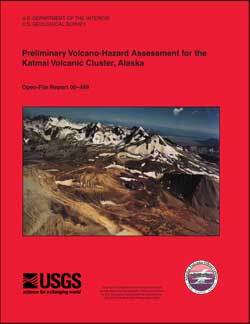 Fierstein, Judy, and Hildreth, Wes, 2000, Preliminary Volcano-Hazard Assessment for the Katmai Volcanic Cluster, Alaska: U.S. Geological Survey Open-File Report 00-489, 59 pp., https://pubs.usgs.gov/of/2000/0489/.